It all starts with Aperion furniture grade finish that hands down is unheard of in its price range . Performance wise, In a home theater setup the Subwoofer provides bass that is fast and tight even with the most demanding specail effects. It won’t rock the house . In trade you get clear undistorted bass response . The S-8 8” Subwoofer driver really shines musically . The bass response is accurate and clear with a punch . The Aperion S-8 boasts a smooth slotted rear ported cabinet with 3/4 inch walls housing a 150 watt high efficiency class D amplifier powering a treated 8” Subwoofer driver. If you are looking for loud distorted bass . This is not the Subwoofer for you . Aperion focused on providing the quality build that provides a wonderful musically aspired experience . It won’t hit those low end frequencies below 35 hertz. Keep in mind the human ear can’t hear bass responses below 20 hertz . 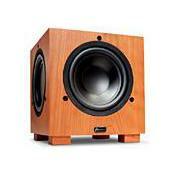 To find a 8” Subwoofer with a compact cabinet that get reproduce clean bass below 35 hertz is a hard fined . Can't go below 35 hz, but in most cases this is not a problem. This is the nicest subwoofer under $500 I have ever heard. It is very musical while reproducing 35 hz to 85 hz very accurately. The sub also seems to be very efficient making the most of the 150 watt amplifier. Unfortunately it really can't go below 35, but for most applications this isn't a problem. This sub is also very well built. I have seen several other subs at higher price points that aren't near the build quality of this.